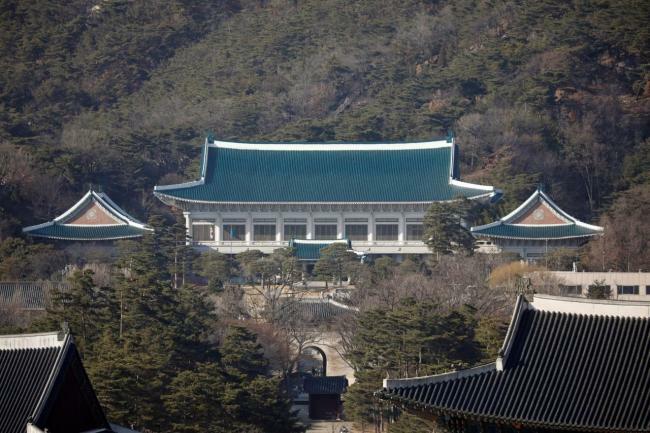 President Moon Jae-in on Thursday nominated five new ministers, including ministers of defense and education, and four vice minister-level officials, carrying out his first Cabinet reshuffle since taking office. For the post of Minister of National Defense, Moon tapped Chairman of the Joint Chiefs of Staff Jeong Kyeong-doo, who built his career in the Air Force. Jeong is to replace Song Young-moo, a former Navy admiral who has been at the center of numerous controversies during his term in office. Defense Minister-nominee Jeong Kyeong-doo speaks to reporters on Thursday. If confirmed, Jeong will be the second consecutive defense minister without an Army background, which has been seen as part of the president’s drive to strengthen the Air Force and Navy, as well as to lessen the Army’s grip on the military. Before taking the helm of the JCS, Jeong served as the top commander of the Air Force. 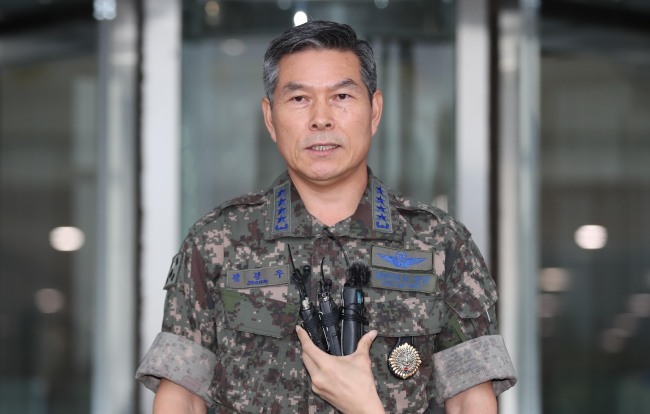 Describing Jeong as an “expert in improving defense capabilities,” Cheong Wa Dae spokesman Kim Eui-kyeom said that the Air Force general has been selected for his drive and experience. “(Jeong) has ample experience and views on military operations and defense policies,” Kim said, adding that he is a “man of principle” who completes any task he has begun. For the post of education minister and deputy prime minister for social affairs, Moon tapped ruling Democratic Party of Korea lawmaker Rep. Yoo Eun- hae. At 55, Yoo is the youngest to be nominated for the post since it has been linked with a deputy prime minister position. Ahead of Thursday’s announcement, it had been rumored that current Education Minister Kim Sang-gon would be replaced over the failed attempt to revise the country’s university entrance system. Moon also tapped the ruling party’s Rep. Jin Sun-mi to head the Ministry of Gender Equality and Family. For the Ministry of Trade, Industry and Energy, Moon picked Sung Yun-mo. Sung is a career bureaucrat who spent much of his career at the Industry Ministry and served as the ministry’s spokesman before being selected to head the Economic Policy Coordination Office of the Office for the Government Policy Coordination in June 2016. Sung has headed the patent office since July last year. Another career bureaucrat, Lee Jae-kap has been tapped to head the Ministry of Employment and Labor. Lee spent most of his career at the Labor Ministry, rising to the post of vice minister during the Lee Myung-bak administration. Lee has also served as the head of the Korea Workers’ Compensation and Welfare Service. Along with the five ministers, Moon also named four vice minister-level officials. For the post of Defense Acquisition Program Administration chief, Moon selected Wang Jung-hong, the current secretary-general of the Board of Audit and Inspection. The move has been taken as a sign of Moon’s determination to eradicate corruption and irregularities within DAPA, which has been implicated in several scandals in recent years. “He is one of the most prominent financial auditor of the BAI. He will eradicate defense industry corruption, and nurture and manage the defense industry befitting the era of fourth industrial revolution,” the Cheong Wa Dae spokesman said. To head the Cultural Heritage Administration, Moon tapped journalist Chung Jae-suk. Chung began her career at a progressive newspaper, and currently works as a culture reporter at a major daily. Moon also appointed Yang Hyang-ja, a former Samsung Electronics executive, to head the Central Officials Training Institute, and prosecutor-turned-lawyer Rhee Suk-soo to head the National Intelligence Service’s planning division. Yang was the first high school graduate to hold an executive level post at Samsung Electronics, and served as a member of the Democratic Party supreme council from June 2016 to August this year.